So I admit, I’ve had a thing for fair isle lately. So much so, that last weekend I wore it two out of three days of the weekend (yeah, let’s consider Friday night the weekend). Being that our winter waited until January to show up, I’ve been a little slow on my sweater game this year. 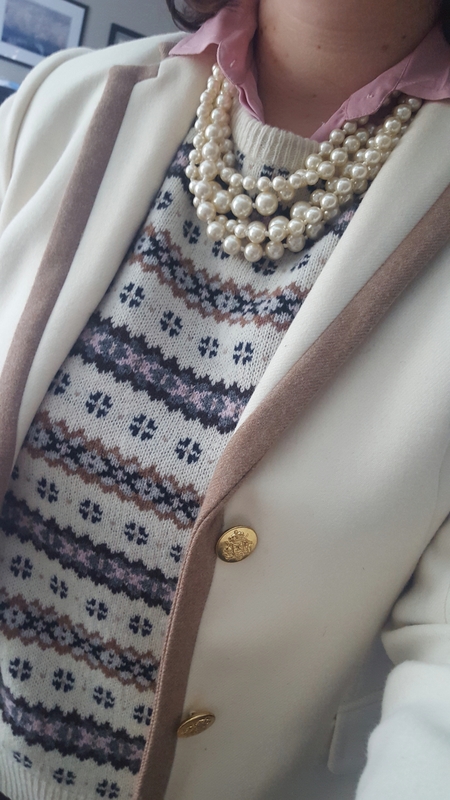 My latest sweater purchases have been of the fair isle variety and after receiving the J.Crew Fair Isle Crew Neck Sweater in ivory, I knew I could wear it to work on a chilly Friday. I almost didn’t post these photos because these Banana Republic pants are too big on me. It was of those things where I tried them on, thought they looked ok and then when I took photos I realized they were big and as the day went, on, I got increasingly annoyed about how big they were. So yeah, while I love the color and that they have an elastic waist, they’re a size too big. By the time I take photos in the morning it’s too late for me to change without totally losing my mind. But, from a color standpoint, while I think it’s really brown in this sweater and not burgundy, I had an easier time pairing it with burgundy pieces. I have since re-ordered the pants in a smaller size (12) and they are perfect! I love that there’s some pink in this sweater as well. And with it currently being $30 with the sale, it’s a classic piece that I know I will wear for years. I think the sweater runs a tad small, as the large was a perfect fit. After a full week of work, we had a low key Friday evening, walking to a local restaurant for dinner (in chilly, rainy weather) so I switched it up to a vest and flats (flats also being a poor decision with the later rain; luckily it wasn’t so bad). 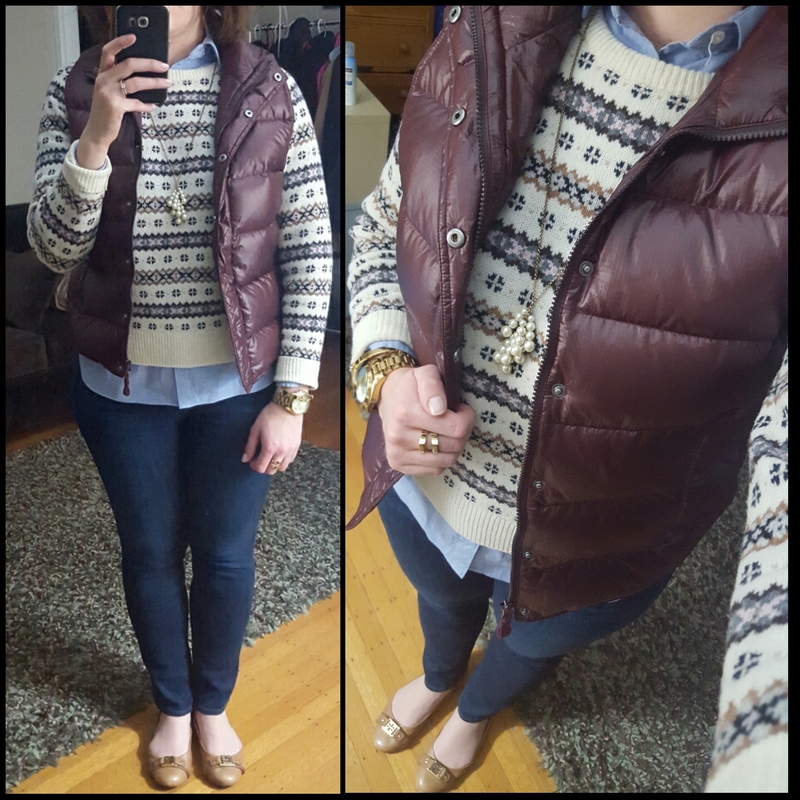 I affectionately call this my Marty McFly vest because…well…you can see why. I also tried this with an ivory vest and liked the look of that as well, but liked the contrast of the burgundy vest. 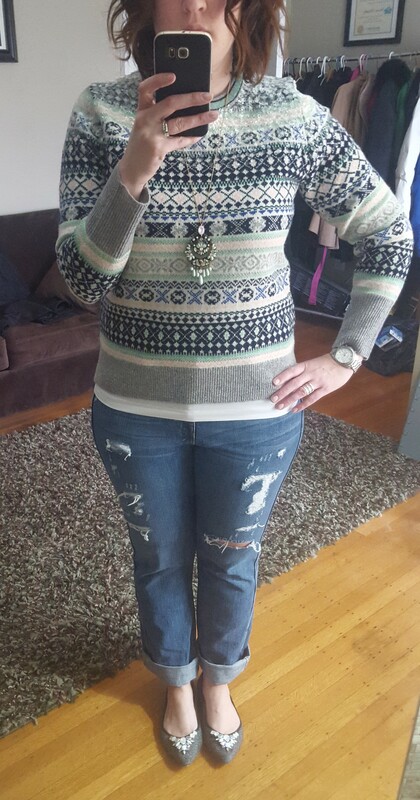 And lastly, I wore the J.Crew Sequined Fair Isle sweater on Sunday for a family party. I’ve said it before, one of the perks at shopping at primarily one retailer (especially J.Crew) is the uniformity of colors across seasons and the ability to coordinate. This sweater was a PERFECT match with my necklace and shoes, both purchased in the last year. We ended up with more wintery weather later on Sunday so these shoes were strictly for indoor purposes – don’t be fooled, I’m in socks and boots when I venture outside! Both of these sweaters are on sale right now and the sequin sweater has been popping back regularly in all sizes. Would love to hear what you think and thanks for visiting!